How can I programmatically delete a user in Drupal 6? Change the author on any node created by the deleted user to "Anonymous"
The previous developer created a custom module for account management that allows adding users under several different circumstances. For example the user is completely new to the company adding it, which means they need to be added to our other unconnected systems as well, as opposed to providing a Drupal account to a user who is already in our other systems. I've looked at the API and found user_delete, but it requires two params - $edit and $uid. The uid is no problem, but all I can find about $edit is that it's "an array of submitted form values." We're not using a form, though; our user lists are static text, and the actions all occur onclick of an href (at this point); so there's nothing being submitted. Is there any way I can fake the values of $edit? Or is there another way to do this? I'm reading about hook_user() and thinking that I'd call user_delete() somewhere to do the actual delete, and then my hook_user() implementation would handle the rest with the $op = delete param. But before I worry about how to get the other stuff happening, I need some guidance about how to call user_delete(). Is it even worth it to use user_delete()? Would it be less trouble to just write my own queries to delete the user record and change any content records to "Anonymous"? handled by the node module. To delete a user account, and assign all the nodes the user authored to the anonymous user, you simply need to call user_delete(array(), $account->uid), or user_delete(array(), $uid), depending if you have an user object, or a user ID. 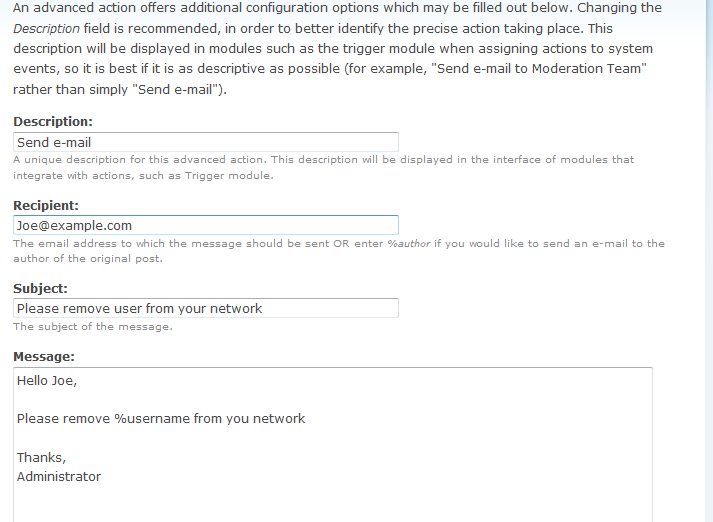 As you see, the function already updates the nodes authored by the user account being deleted, and any node revisions where associated with that user account. The first parameter required from user_delete() is normally not used from the implementations of hook_user(), when the $op parameter is set to "delete." In most of the cases, the modules just use $account->uid to identify the user data they wrote in their own database tables. Even supposing the modules saved the data using another value to identify the user account, it is a value contained in the user object. As per writing your own queries to delete the user account, I would not suggest doing it, as there could be modules that need to be informed when a user account is delete, usually to delete the data the module associated to that account. Rewriting code when there is already a function for this specific purpose could mean also to update the code when passing to a new Drupal version. The code would not be as generic as the code already used by Drupal. And your done! By default, when you delete a user, all of their post turns to anonymous. You now have a choice of where you want to delete users now. Everyone of these ways will automatically sent an email out for every deleted user. I believe this way is more flexible as you can change the email body and recipient without editing any code. Not the answer you're looking for? Browse other questions tagged 6 hooks users or ask your own question. How do I allow users to determine which other users can edit their content? Is it possible for an administrator to delete pending user relationship requests (between users)? Is there an existing module to bulk delete user content but not user? Giving users control of who sees their information?